The Garden of the Gods Pool Oasis is a spacious, luxurious and stately collection of exclusive watering holes, decadent cabanas and palatial sunbathing spots in the ultimate warm-weather destination -- no matter whether you bow before the gods of the sun or the water. There are more than 40 cabanas in all, with stocked refrigerators, flat-screen TVs, DVD players, iPod docks, wireless Internet, ceiling fans and plush furniture. Some of the deluxe services offered poolside include frozen towels, Evian face spritzers and body massages. Or, just keep it simple and lay out in one of more than 1,700 deck chairs. 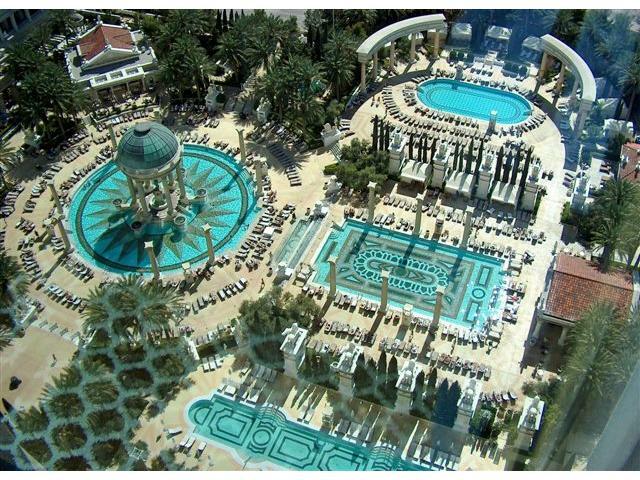 The Roman goddess of luck beckons you to try yours at this action-packed pool. Play a few hands of swim-up blackjack, have a bite to eat or visit the Sun Lounge for a satisfying selection of martinis as well as a Scotch tasting menu sure to appeal to whiskey aficionados. The most relaxing pool experience, the Jupiter pool is secluded in the northwest corner of the Garden of the Gods. Relax your way -- in one of five cabanas, eight day beds (available with or without canopies), three scoop daybeds or chaise lounge chairs surrounding this blissful pool. The perfect place to mingle, meet and greet, the Neptune pool is the social hub of the Garden of the Gods. Splash among the beautiful people, get some sun or just relax. The Neptune pool features eight cabanas, 24 daybeds (available in three different varieties) and chaise lounge chairs for your enjoyment. This iconic pool is the classic image of Caesars Palace swimming, an elegant spot with statuary and columns, with lounge chairs surrounding the round pool offering some of the most striking views of the Garden of the Gods Pool Oasis. Its five cabanas and 17 daybeds offer another level of luxury. The Venus Pool Club is the most well-appointed and exclusive pool experience in Las Vegas, a sophisticated and secluded European-style retreat from the people who brought you PURE Nightclub. Ultra-high-end food and beverage choices are available, including a roving margarita and Mojito cart, and premium real estate is yours for the asking. With eleven cabanas, four couches, 14 daybeds and chaise lounge chairs, you will surely find the perfect spot to catch some rays; people watch or just take in the lush and luxurious surroundings.